Lawrence’s first oldest park, South Park was part of the original 1854 town site. In the original town plat, South Park, located on Massachusetts Street, covered eight city blocks and was divided evenly into four separate parks – Lafayette Park, Hamilton Park, Washington Park and Franklin Park. The bandstand, or the South Park gazebo, was erected in May 1906. On August 31, 1910, a crowd of 6,000 citizens and visitors attended a formal dedication of the Roosevelt Fountain, the granite display fountain. President Theodore Roosevelt was present at the ceremony, arriving by train at the Santa Fe station in Lawrence. The fountain was originally located at the intersection of New Hampshire and Warren (now Ninth) Streets, because of its proximity to a livery stable. However, with increasing automobile traffic, the fountain’s location soon became unpopular after many dented fenders. The fountain was moved to Robinson Park in 1929, just west of present-day City Hall, with the promise of protection. In 1965, the Lawrence Flower Club members, celebrating their 40th year, petitioned the city commission and parks department to move the forgotten fountain to a site in South Park. 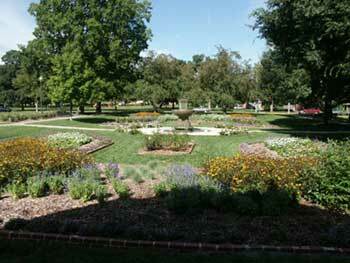 Later, a rose garden was created in South Park by Robert Rankin. The fountain needed cleaning and restoration by 1982, and, once again with the request of the Lawrence Flower Club, the fountain was restored. A historic component to Downtown Lawrence, South Park has traditionally been a place for people to relax and play. Located in the heart of beautiful Downtown Lawrence, the rich tradition of South Park is held as Lawrence’s premiere meeting place. 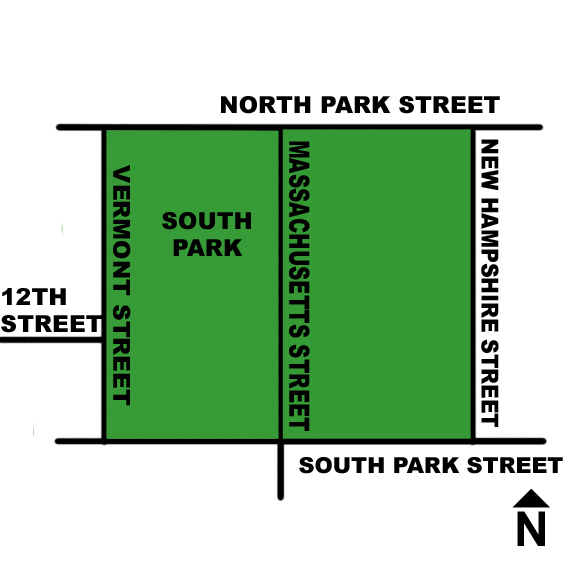 Spread out across Massachusetts Street, South Park is divided into two areas with distinct atmospheres. East of Massachusetts Street features the William Kelly Bandstand, which is a popular place for special events, weddings, parties, and the home of the Lawrence City Band’s Summer Concert series. This side of the park also includes the Roosevelt fountain, picnic areas and flower gardens. Trees line the walkways throughout the park, and benches offer relaxation and tranquil areas for visitors. The West side of the park is full of playground equipment, swings and slides for children’s enjoyment, with the South Park Wading Pool nearby. Children may also enjoy and learn from the Butterfly Garden. There is also an area designated for butterfly habitat in conjunction with Monarch Watch. The Parks and Recreation Administrative Offices are also located on the west side of Massachusetts Street. The Community Building also resides north of the west side of South Park. West of Massachusetts Street also has large open areas that are used for public events. This active side of South Park is often filled with visitors and outdoor activities and is the perfect area for a family picnic or to toss around the Frisbee. South Park is also known for a variety of different trees. An inventory of the trees was developed through the department’s use of Treeworks mapping and ESRI story board was developed. To view the information and take the self-guided tour, please visit: http://arcg.is/1fXeq8. Events that annually take place in South Park include: Art in the Park, the Parks and Recreation Fall Arts and Crafts Festival and a host of other events. There are no shelters located in South Park, but the William Kelly Bandstand (gazebo) is available for rent. To find out about other shelters available for rental, visit our shelter rentals page. If you are looking to reserve an outdoor shelters and/or indoor facility, reservations are taken at any of the community recreation centers including the Community Building, 115 West 11th St.; East Lawrence Recreation Center, 1245 East 15th St.; Holcom Park Recreation Center, 2700 West 27th St.; Lawrence Indoor Aquatic Center, 4706 Overland Drive, Sports Pavilion Lawrence, 100 Rock Chalk Lane and the Parks and Recreation Administrative Office in South Park, 1141 Massachusetts St.
See our shelter rentals page for more information on renting these facilities or call (785) 832-7920.